Riverbed®, The Digital Performance Company™, enables organisations to maximise digital performance across every aspect of their business, allowing customers to re-think possible. 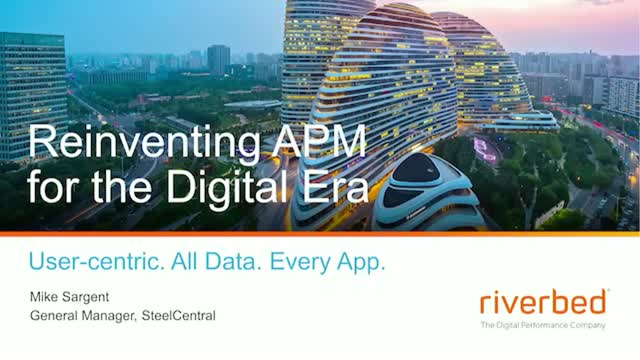 Riverbed’s unified and integrated Digital Performance Platform™ brings together a powerful combination of Digital Experience, Cloud Networking and Cloud Edge solutions that provides a modern IT architecture for the digital enterprise, delivering new levels of operational agility and dramatically accelerating business performance and outcomes. At more than $1 billion in annual revenue, Riverbed’s 30,000+ customers include 98% of the Fortune 100 and 100% of the Forbes Global 100. Learn more at riverbed.com. Digital Transformation is driving business and IT leaders to dramatically rethink how their networks are managed, especially to embrace an increasingly complex IT landscape. Often overlooked, networks are required to deliver increased performance, while still be extremely flexible and agile. SD-WAN allows organization to manage and optimize the network in new, more efficient ways, allowing Digital Transformation to be successful. This webinar addresses core challenges and opportunities organizations are facing, and outlines paths to a transformative digital business. Many companies view application performance management (APM) solutions as an integral part of the DevOps toolchain. That’s because APM provides a powerful source of business intelligence that can improve developer productivity, software performance, and end-user satisfaction—all of which contribute to more impactful releases and a healthier bottom-line. Of course, realizing these outcomes is contingent on having a sound APM monitoring practice, complete with the proper tooling, processes, and skillsets. Does BYOD Mean Bring Your Own Dissatisfaction? Enabling a mobile workforce is a business necessity. But, BYOD and the ever-growing number and types of apps and devices complicate matters. While mobile workspaces provide some level of control, enterprises still struggle to deliver 5-star digital experiences to their mobile end users. The market is crowded with SD-WAN providers – from pure-play startups to more established infrastructure and WAN specialists. With so many vendors, each offering different SD-WAN features and functions, how do you find the solution that’s right for your organization?